When you think of Alberta, what comes to mind? West Edmonton Mall, prairies, beef, cowboys….the Calgary Stampede? You might be surprised to know Alberta has dinosaur fossils, quick sand, glaciers, and some of the most beautiful scenery East of the Rocky Mountains. Albertans love to travel and stay-cations are right up there with the best of them. With the mountains on our West and badlands to the East, day trips are as common to us as peanut butter and jam. We are starting a new series of posts called Alberta Bound covering all the things we enjoy in Alberta. There are lots of amazing day trips you can take here in Wild Rose Country so follow along as we keep adding to this series. In no particular order we list a few of our favourite 10 Day Trips from Calgary. With any of these trips we recommend you pack an emergency medical kit, road trip snacks, extra water, a fully charged camera + batteries, good walking or hiking shoes, bug spray and sun tan lotion. Also a hat and bear spray depending on your adventure. All estimated travel time is from Calgary. Lake Louise is nestled in the heart of the Rocky Mountains and a favourite tourist destination. Keep this in mind when arriving near the lake itself and trying to find parking during busy times. You may end up with a longer walk than anticipated to the lake itself due to all the traffic. Once you arrive at the lake itself, all else is forgotten as the lake view is breathtaking. Once you’ve inhaled as much of the beauty of the lake itself, there is more to do. Find one of the many trails and go on a hike. The Lake Agnes & the Tea House or Plain of Six Glaciers & Tea House are two popular hikes to discover. Seek out the Gondola and try to spot a Grizzly Bear down below (this happened to me once). If you love the water rent a canoe and explore the lake first hand. 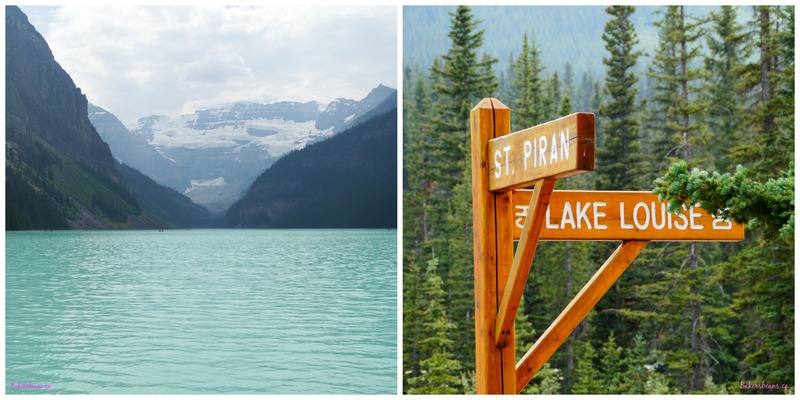 Driving from Calgary, this trip will take you approximately 2 hours to Lake Louise. Allow 4 hours round trip. Plan your trip to Drumheller down Hwy 9 so you can stop and experience Horseshoe Canyon. As you pull into the parking lot you have no idea what awaits you down yonder. Walk to the canyon and an enormous opening awaits. An opening that began over 70 million years ago and is the beginning of what we know as the Badlands. Horseshoe Canyon represents three unique habitats or ecosystems: the prairie, the wooded coulee slopes and the badlands. There are trails taking you into the canyon for those more adventurous types. 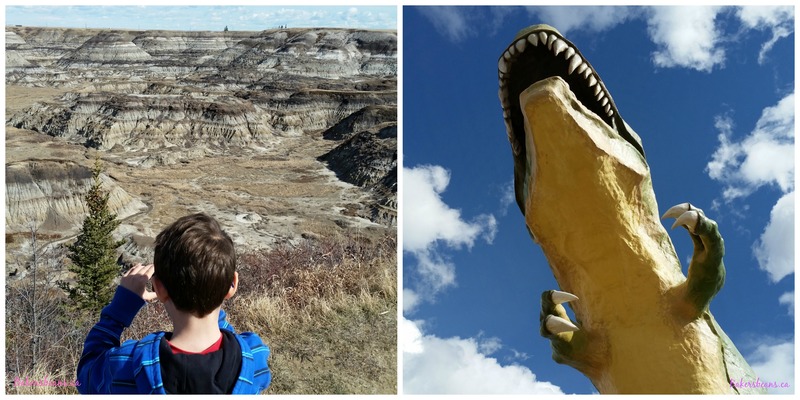 Get back on the road and roar your way into Drumheller. Ensure to be on the lookout for the dinosaurs you will encounter along the way. When you arrive be on the lookout for the World’s Largest Dinosaur, an 82ft replica of a Tyrannosaurus Rex. For a small fee you can climb the dinosaur and peek out of his mouth at the view. While in town you can check out the Fossil World Discovery Center for a small fee, and mine for minerals or dig up some fossils. 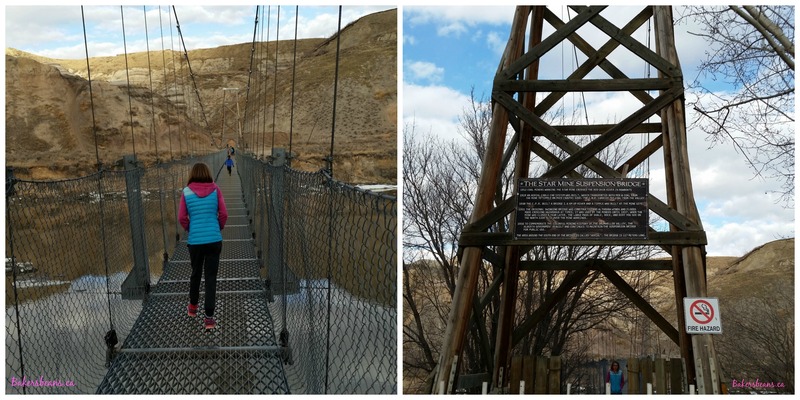 Carry on down the Dinosaur Trail and discover the Star Mine Suspension Bridge. You have to wind your way through a residential neighbourhood to find this gem. The bridge crosses the Red Deer river and was built in 1931 for the coal workers of the Star Mine. There are trails on the other side of the river and the kids even found a few tiny pieces of coal much to their delight. Beautiful views however if you have a fear of heights, do not look down when crossing the bridge. 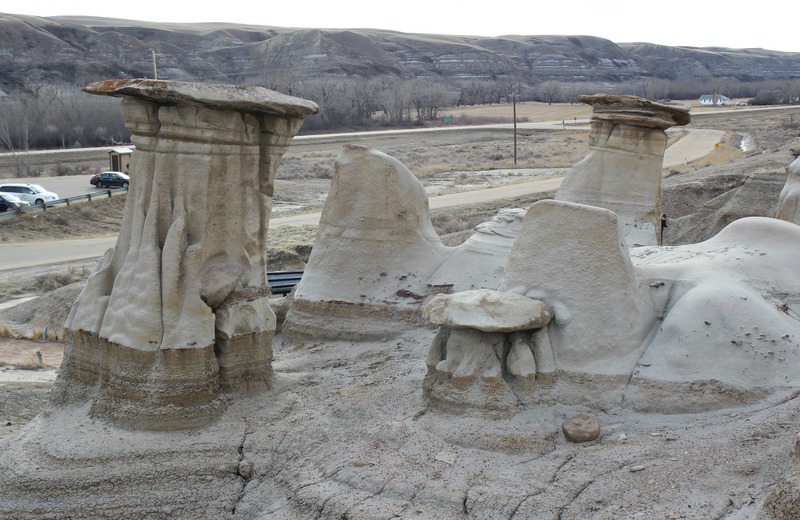 Drive for a few extra minutes and you will encounter your first real hoodoos. Some of them are blocked off and out of bounds for preservation purposes. Others can be explored. I had to stop for a minute and think about how long these magnificent statues have been in these exact spots. If only they could talk. From Calgary this drive will take you about 1.5 hours one way. The Royal Tyrrell Museum of Palaeontology is one of the world’s premiere palaeontological research facilities and Canada’s only museum dedicated exclusively to palaeontology. 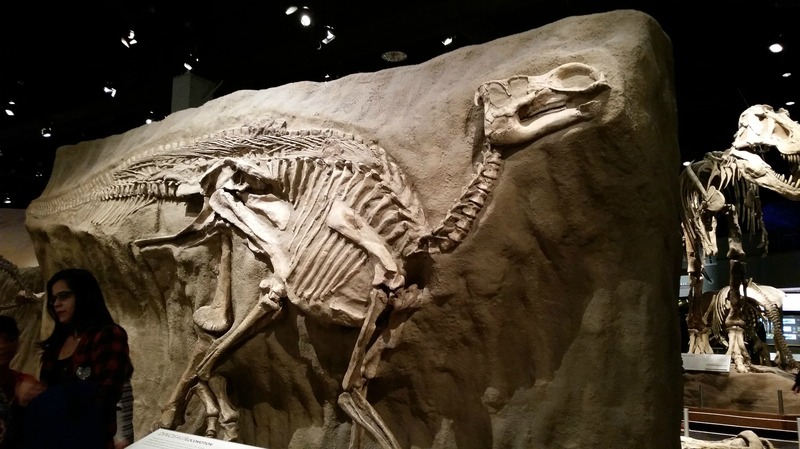 They offer public programs including dino digs (our kids had a blast) and tours for all ages. Reserve your spot in advance as the museum is always busy and programs fill up quickly. Hop outside and scurry over to the lookout point (after climbing a zillion stairs) or scoot over to the Badlands Trail for a short hike. The museum and area could be its own day trip as you need to allow time to browse through this museum. They have a cafe so you could grab a coffee or lunch while you are there and sit outside on the patio although eating in Drumheller might be a little easier on the wallet. A gift store finds you at the end of your museum tour and tantalizes with all kinds of gems and souvenirs. Your looking at an 1.5 hours driving to Drumheller and the museum from Calgary. Drive along Hwy 3 into the Crowsnest Pass and you will discover the site of Canada’s deadliest rock slide in southwestern Alberta. 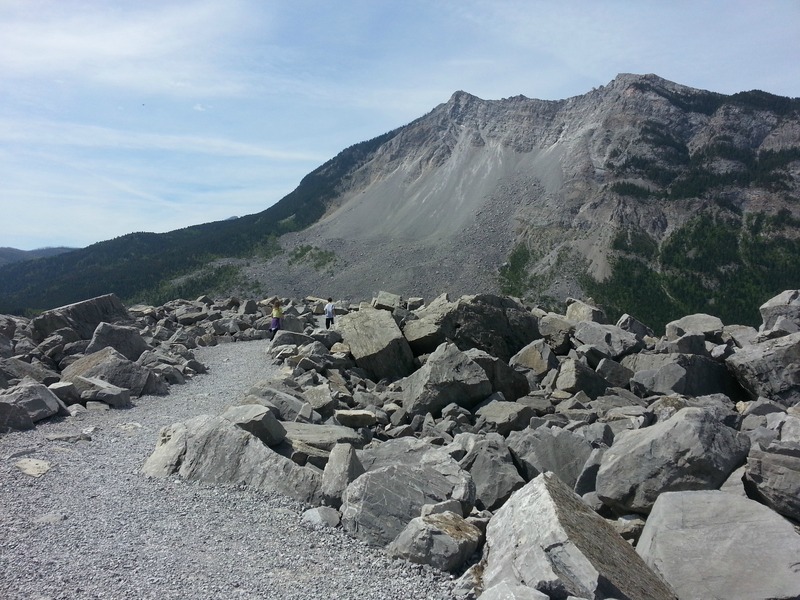 The Frank Slide was a rock slide that buried part of the mining town of Frank, in 1903. The town, Canadian Pacific Railway and coal mine were demolished and this slide is known as the deadliest slide in Canadian history. Approximately 90 lives were lost and bodies never recovered. It’s a beautiful drive and there are many places to pull over for a picnic style lunch. Driving is 2.3 hours Southwest from Calgary. Waterton Lakes National Park is a national park located in the southwest corner of Alberta, Canada, and borders Glacier National Park in Montana, USA. It’s known to many as where the prairies meet the mountains. This UNESCO World Heritage Site, is an International peace park and a biosphere reserve all rolled into one. There are many trails to discover in the area but you will want to see Red Rock Canyon. 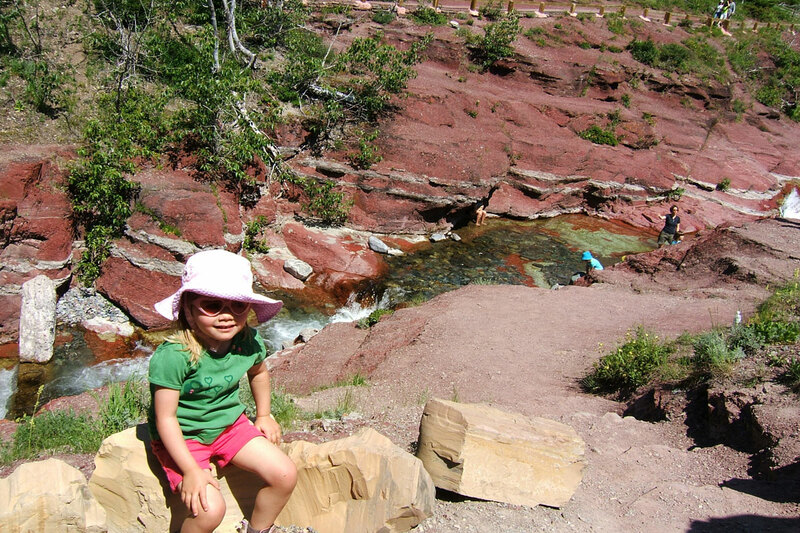 A short drive from the Waterton town site you will encounter bed rock layers with brilliant colours courting a glistening crystal clear stream. Hike along the canyon trail which leads to Blakiston Falls. This day trip will take you almost 3 hours one way or 6 round trip from Calgary. Best to get an early start on your day and plan to return later in the evening. There will be no writing on stone at this UNESCO Heritage Site. An important and sacred spot to the Blackfoot Tribe and many other aboriginal tribes. This park contains the greatest concentration of rock art on the North American Great Plains including over 50 petroglyph sites and thousands of works. A valley rich in history this is a trip worth the drive. They have a couple of hikes to enjoy, but when it’s a hot sunny day ensure you have the bug spray, lots of water and keep an eye out for snakes. Driving this trip from Calgary is about 3.5 hours one way. Did you know Alberta has Quick Sand? It’s like one of Alberta’s best kept secrets that we discovered geocaching back in 2012. This day trip might be best as an over night in Jasper when you factor in stops as it’s a good four hours from Calgary unless you are an early bird and night owl. Bubbling Springs is a lovely pull over area where you will find picnic tables and a toilet next to a natural pool of quicksand. Mr DAPS frequently picnicked here in the early 1960s while surveying the reconstruction of the highway through this valley. There are several stops on this scenic drive from Calgary to Jasper which stops once you pass Lake Louise. Must stops including Falls, Glaciers and Canyons, plus trails and campgrounds to discover. Be sure to explore The Columbia Icefield | Columbia Icefield Discovery Centre | Glacier Skywalk while on your way and be sure to stop at Athabasca Falls. If you are lucky you may encounter several mountain goats and sheep on the road way so careful on those blind corners! We recently did this trip in November during the winter (and speed limit) and it took us just under four hours to get to Jasper via Highway 93. We LOVE Dinosaur Provincial Park. There I said it. We’ve been a good handful of times and even witnessed the birth of a baby deer on one of our camping trips in this park. Besides the threat of scorpions, snakes and black widow spiders we keep coming back here. The Summer heat can be scorching during the days, but the evenings tend to cool off nicely. The park offers summer public programs including guided fossil tours in the out of bounds areas of the park where they take you to discover real dinosaur bones that are slowly being unearthed by the weather. These tours sell out and it’s best advised you book several weeks in advance if possible. This is another UNESCO World Heritage Site and situated in the valley of the Red Deer River. The park is simply stunning. They offer a Visitor Centre featuring exhibits about dinosaurs, fossils, and the geology and natural history of the park. There is a video theater, fossil prep lab area, and a gift shop. Being so close to the river the ‘squitos can be pretty annoying at times. Be sure to have bug spray. Distance wise you are looking at 2-2.5 hours from Calgary. One of the things we enjoy about living in Calgary is the closeness to the mountains. In only a short hour & a half drive, we are in Banff. This town is tucked into the Rocky Mountains and a little more touristy, but there is much to see and do in Banff if you’d rather avoid the touristy side of things. Hi-lights include Cave and Basin National Historic Site, Bow Falls, the Museums, Banff Hoodoos, Banff Hot Springs, hiking trails all over, the Fairmont Banff Springs and so much more. If you are lucky you will catch a glimpse of wildlife along the path. Grizzlies, elk and we’ve seen many deer on our travels. Banff offers up some delicious local food and there are several restaurants, cafes and food destinations (ie: Beaver Tails) to partake in. Distance is 1.5 hours driving from Calgary. For us Canmore is a hop, skip and a jump away. It’s the place we sneak off to more often then not to experience the fresh mountain air, get back into nature and let all our cares float away. In Northern BC we have a mountain range called the 7 sisters. In Canmore they have the 3 sisters. How ironic and magical at the same time. Like so many of my other picks, Canmore offers up great hiking, and camping nearby (when the rain hits we tend to drop into Canmore for a hot lunch and stroll). Be sure to check out the Canmore Museum and Geoscience Centre and some of the several amazing restaurants that are there. This will take about 1 hour to get to.